Kindergarten @ Beacon is a great place to begin your child’s formal education! Our kindergarten learning program will encourage your child’s natural curiosity and equip your child to be ready for the road ahead. Through devotions and singing, sharing and lessons, activities, reading, and so much more, your child will discover with joy to Learn, Explore, and GROW. We are pleased to offer two JK and two SK classes for September 2018. Class sizes are currently small with excellent, certified, caring Christian teachers leading them. 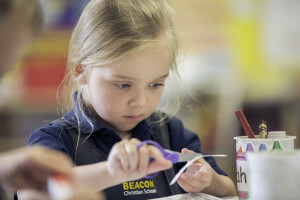 Contact advancement@beaconchristian.org for details on how your child could benefit from Kindergarten education at Beacon Christian School. You are your child’s first and most important teacher! Your child has learned an incredible amount before coming to school. At Beacon, we hope to partner with you to continue this lifelong journey of learning. Bible: The students will learn about the “Wonders of God” as they learn stories from the Old and New Testaments through stories, songs and drama. Language Arts: The “Jolly Phonics” program is featured, which presents letters and sounds through stories, actions, and music. This program serves students at different levels of development and has a strong emphasis on phonics and early reading skills. Recognizing sight words and word families are also introduced. The students read words, sentences and poems and are introduced to the many books in our class and school library. Writing is done in journals, dictated stories, class “big books”, as well as their daily work. Hand Writing Without Tears is the method used for introducing printing skills. Math: The students are introduced to math concepts through a hands-on manipulative math program. The students work with common objects as well as participate in pencil and paper activities. Creation Studies: Students will explore God’s creation through investigations, observations, questioning and sharing of their findings. Each month a new topic is explored that relates to our world and the four seasons. Art and Music: Students have the opportunity to express ideas and feelings through visual and creative art experiences. Through music and song, students acquire music skills and have fun praising the Lord. Music and art are integrated throughout the planned learning experiences. Twice per month, the students will also participate in a primary sing time with all students, JK to grade three. Physical Education: The students will participate in creative movement and other daily physical activities for muscle development and growth. In gym class and outdoor play, they will practice basic skills such as throwing, catching, rolling, jumping, running and hopping through various activities and games. Technology: Once per week, the SK students learn computer skills in the computer lab. These skills will enable the students to explore on a daily basis various literacy and math activities on the class computers, iPads and SMART Board. Co-Curricular Activities: Special enrichment activities are provided to enhance their learning experiences. Fall, winter and spring hikes in the woods allow the students to experience the changing seasons and explore God’s creation. Other highlights include visiting the Butterfly Conservatory, the Purple Day Parade, the Pumpkin Farm Trip and the Train Trip. At Beacon, our afternoon kindergarten class combines students in JK and SK for a play-based social curriculum that builds on the morning activities and provides additional opportunities for reinforcement of new skills and learning. Through both outdoor and indoor play, students grow their oral communication skills to learn to negotiate and articulate their ideas and play plans with each other and the teacher. Inquiry-based learning supports students “wonderings” and encourages an excitement for thinking and learning about God’s world and our place in it. Through our gathering and reflecting circle-time activities, students interact and listen to each other and enjoy shared books and poems. Each week there are planned art experiences, music and movement activities with simple rhythm instruments, gross motor development and the integration of technology in our learning. At least one hour every afternoon is open for students to choose activities based on their own interests from the different centers available (sensory, art, dramatic play, construction, puzzles, play dough, board games, science, etc.). Literacy and numeracy concepts are reinforced through whole-group experiences during our gathering circle and small group or individual instruction during Activity Centre time. We encourage parents to take time before the child is in kindergarten to introduce the child to the joy of learning. Provide your child with constructive manipulative toys such as crayons, blocks and other building materials, clay, beads, scissors, tinker toys, Lego, all varieties of paper, puzzles, balls and music. Try to determine which hand your child uses to write, etc. If they are left-handed, provide them with a child’s “lefty” scissors. Help your child to use words to describe shapes, sizes, colors, likeness, differences, rhymes, opposites. Ask them to describe what they are hearing – A train whistle? A bird singing? A car? Teach your children to follow directions. Keep directions simple and support them as they follow accordingly. Help your child develop skills in listening and being attentive as you read stories and give instructions. Help your child to learn his or her proper name, age, address, telephone number and birth date. Encourage your child to ask questions. Show respect for your child’s ideas. LISTEN! Encourage curiosity and interest. Help your child feel good about her/himself. Help your child progress from baby talk. In school, it becomes an obstacle for the child. Take your child places: the library, stores, Ontario Early Year Centres, Parenting and Family Literacy Centres, etc. Develop your child’s social habits such as saying “please”, “thank you”, and “excuse me”. Learning how to work and play with others, to share, and to keep promises are also important skills to teach. Help your child feel comfortable away from parents and home. Encourage special friendships with one or two close friends to give confidence about leaving home. Limit TV programs and computer activities to those you feel will benefit your child. Participate with your child by watching a program together and talking about it. You can help create the desire to read by reading to your child every day. Encourage interest in reading traffic signs and recognizing labels. Introduce your child to numbers and letters as interests and awareness develop. If your child wishes to write his/her name, encourage lower case letters for all but the first letter of the name – David not DAVID. Develop good hygiene procedures and proper hand washing techniques. Help child learn to take shoes on and off. Support your child as they learn to open snack packaging and containers. Central to Beacon’s Kindergarten program is the intention that teaching and learning will occur in a Christian context. Children will learn how the Bible is God’s Word. They will learn stories and teaching that will help them understand their calling to give glory to God and to serve others. Three times a year a thorough report will be issued. The reports are primarily anecdotal but they give a good indication how the student is developing academically and socially. Parent – Teacher Conferences take place each term. Students who experience difficulty in the academic or social aspects of the program will be carefully tested by our Special Education Teacher. Extra support for these students will be provided. A child who turns 4 or 5 years of age before December 31st is able to start junior or senior kindergarten in September of that school year.